This sthalam is situated outside this world. The Lord is Paramapadanathan in seated posture facing south There is a belief that the Lord will give darshan here to those who have visited & worhipped him in the 106 divyadesams. Theertham - Virajaa river, Ayiramadha Pushkarini. Nammalwar - 2543, 2545, 2552, 2652, 2867, 3000, 3040, 3431, 3465, 3585, 3627, 3740, 3747, 3755-3765. The Moolavar of this Vinnlaga divyadesam is Paramapadha Nadhan. He is found in Veetrirundha thirukkolam on Aadhiseshan facing along South direction, which is said to be the direction of Dharman. 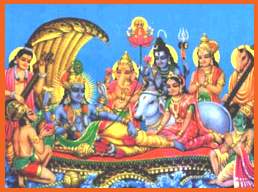 Prathyaksham for Aadhiseshan, Garudan, Vishwaksenar, Vishvakseniyar, Nithyasoorigal and Jeevathmas. This temple is located just 3 furlong from the Kanchipuram Station. The temple is exactly located at Periya Kanchipuram.